In their book entitled Distance Education: A Systems View, Michael Moore and Greg Kearsley provide an informative summary of their view of what determines the success of distance teaching. 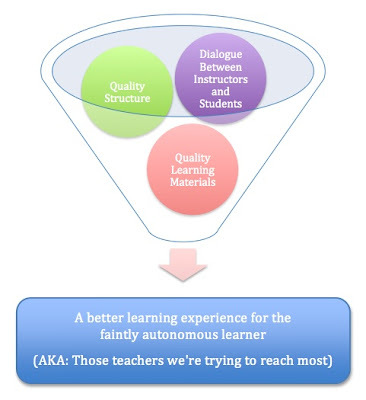 What determines the success of distance teaching is the extent to which the institution and the individual instructor are able to provide the appropriate structure in design of learning materials, and the appropriate quantity and quality of dialogue between teacher and learner(s), taking into account the extent of the learners’ autonomy. Moore, M. G. & Kearsley, G. (2005). Distance Education: A Systems View. Belmont, CA: Thomson Wadsworth.